Trevor is a small but fierce cyclone about to move into the northern Cape Yorke peninsula. High winds and heavy rains will sweep across the peninsula through the next 24-36 hours. 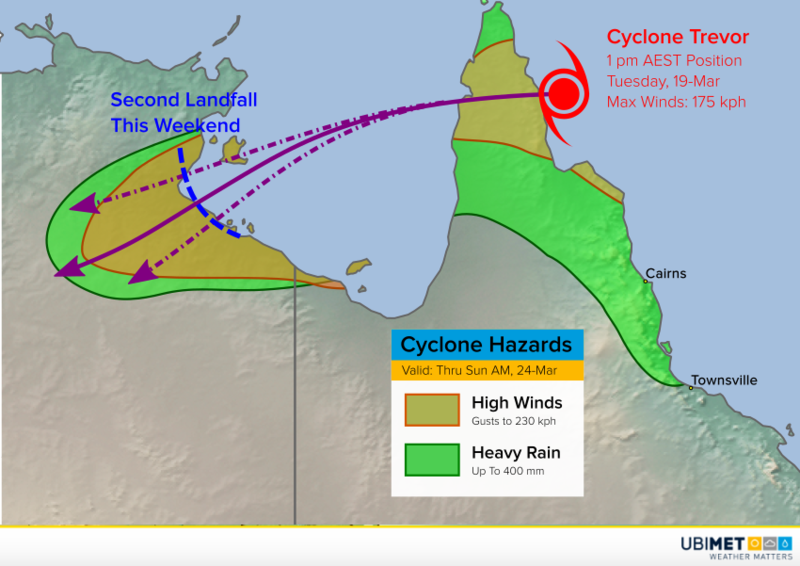 By late Wednesday into Thursday, Trevor will be emerging over the very warm waters of the Gulf of Carpentaria. Rapid intensification is likely before a potential second landfall this weekend in northeast NT! Dangerous high winds and flooding rainfall are lashing the northeast coast of Queensland, especially from Innisfail north (see map above). Rainfall locally up to 400 mm is likely before the storm is over, leading to significant flash flooding. Damaging winds are affecting a smaller area of the peninsula, but within that zone gusts up to 175 kph are likely. Trevor could be even stronger for the second landfall as compared to the first with higher winds exceeding 200 kph! Trees and powerlines will come down with these winds, leading to prolonged power outages.